In company, corporation or organization using Office 365 or any of its desktop, cloud or hosted component services such as Exchange Online, Skype for Business Online, SharePoint Online, Azure Active Directory, and others, there may be a need to temporarily disable and suspend a user. For example, to preserve the data when an employee of staff resigned or left the company, to accommodate temporary workers who work on and off, or when an employee or staff was facing disciplinary action or inquiry there is a necessity to disable user access to avoid any unwanted or malicious activity, or when there is suspicious activities such as user name or password compromised by hackers. Unlike Active Directory, Office 365 does not have an option named “Disable” which does exactly what it said, to disable a user account instead of deleting it. However, you can make use of blocking sign in as an alternative to block and disable a user. 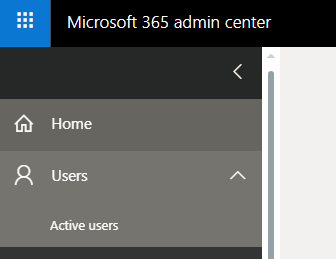 Log in to the Office 365 admin center (https://portal.office.com/)﻿. Go to Users -> Active users. Click or tap on the user account that you want to disable. You should be presented with an overview of the user account. Hit Edit at the end of the Sign-in status. Select Block the user from signing in and hit Save. 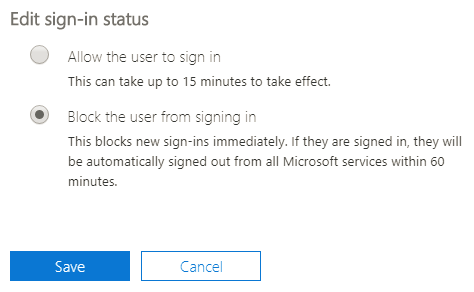 The option blocks new sign-ins immediately, and automatically signs out logged-in user from all Microsoft Office 365 services within 60 minutes. Blocking user from signing in to Office 365 is essentially the same with disable that user account. While blocked and suspended, no one can sign in as the user, but the account can continue to receive email messages and all data is not removed. Note that only administrators can block or unblock a user.